Good news to computer users who are running Windows 10 on a computer with Intel HD Graphics. Intel, the world’s largest manufactures of microprocessors, has just released HD Graphics drivers for Microsoft’s newest version of Windows to help early adopters of Windows 10. Drivers are available to support for 2nd generation Intel Core processors with Intel HD Graphics 3000/2000 and Intel 3rd generation Intel Core processors with HD Graphics 4000/2500. According to a press release from Intel, these drivers support flicker free rotation, Microsoft DirectX 11, and native stereoscopic 3D. The driver is also available for Intel HD Graphics 5500 for 5th Generation Intel Core Processors. Separate downloads are available for x86 and x64 types of Windows 10. So, make sure you download the right version of the driver. We suggest create a system restore point before installing drivers just in case anything goes wrong during the driver installation. If something goes wrong, you can easily restore Windows 10 to an earlier date. If you are not sure what Intel processor or graphics you are using, please use Intel Processor Identification Utility or Device Manager. To check the model of the graphics car, right-click on Start button, click Device Manager, expand Display Adapters to see the graphics card model. Interested users can visit below provided download link to download the driver. Please note that this driver doesn’t work on Windows XP, Vista and Windows 7 operating systems. 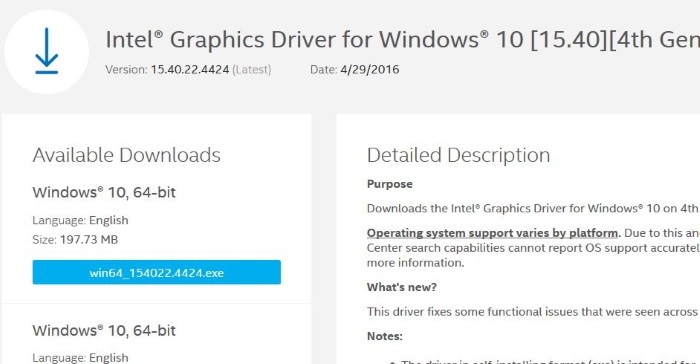 Note that with default settings, Windows 10 automatically download and updates your Intel HD Graphics driver. If you want to stop it, refer to our how to disable automatic of driver updates in Windows 10 guide. Thanks for the comment, Lalit Joshi. your contribution is THE NO. ONE. only thanking U is not enough. pl. clearly mention things available for “vista” too. love and a genuine respect for you…..